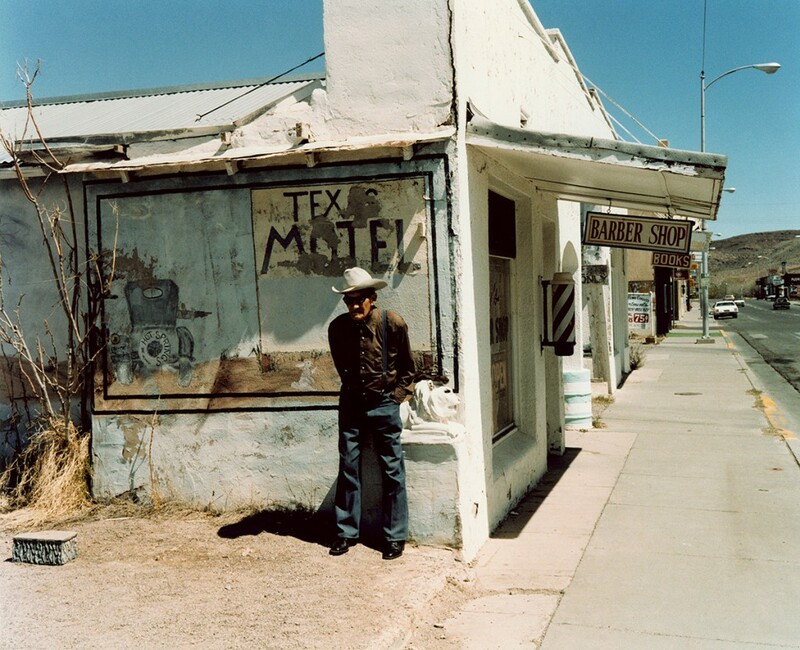 Written in the West, Revisited is a collection of photographs by the director Wim Wenders, shot across the American Southwest in 1983 during the location scouting for Wender’s 1984 film, Paris Texas. 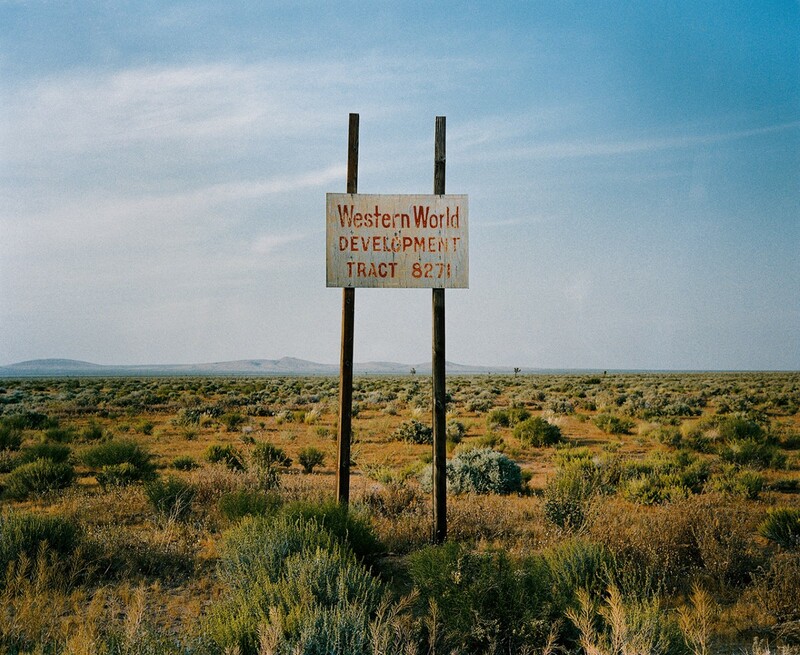 Wenders explains in an accompanying interview with Alain Bergala that he used a 35 millimeter Leica for his scout-work; these photos, however, he thought of differently and shot on a medium-format Plaubel Makina 6×7. They were not taken for locations, but rather taken to sharpen Wender’s empathy with the and light and landscape of the American West. Although Written in the West, Revisited is a peaceful book full of still images, there is a tension running through it between the colors and shapes of civilization and those of the natural world. 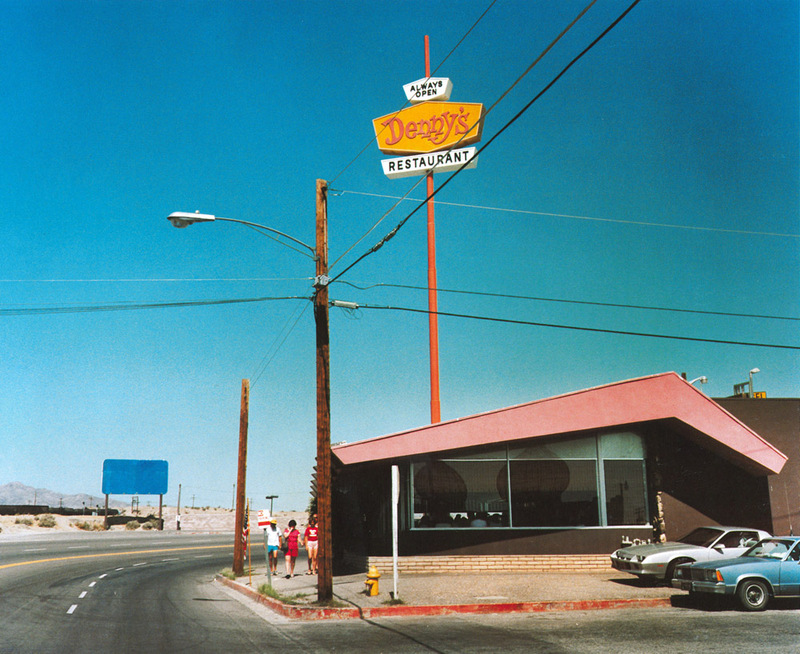 In the lobby of Gila Bend, Arizona motel the couch and Coca-Cola machine are William Eggleston-red, and the candy-colored leather lounge-chairs sit beneath an understatedly surreal landscape painting – a blue road winding through desert crags above a sprawling lake. The violent teal stucco of the cover photo, Entire Family (Las Vegas, New Mexico) butts up against the sky, which here is just a shade lighter than pure cobalt blue, but is in other photos a burnt orange extension of the sun and reflection of the desert floor. 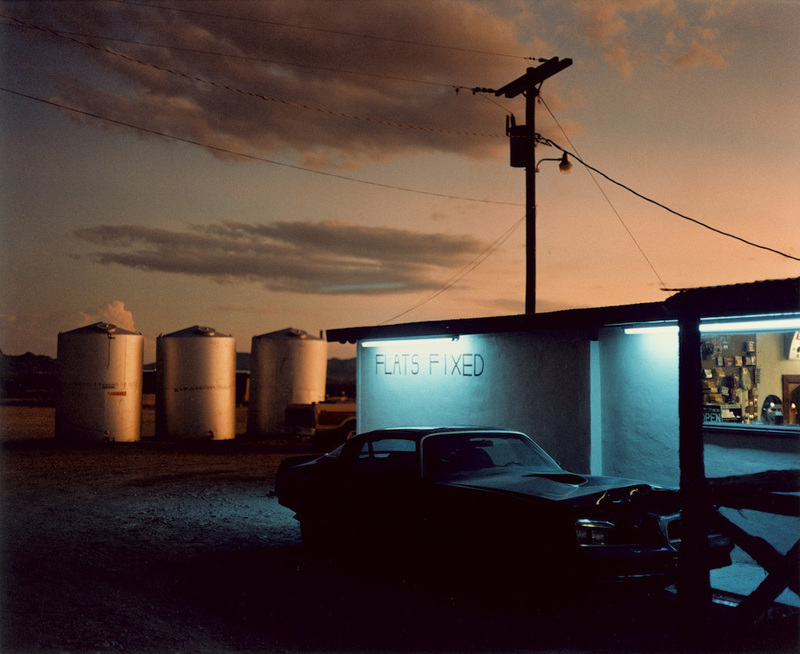 And there is the conjunction of man and nature in the pale green alien hue of the wall of an auto shop in Terlingua, Texas, lit up by fluorescent lights in the foreground of a sunset. The images are curious but impersonal, like something shot by a robot studying humanity. There are almost no humans in Wender’s photos. I almost forget there’s a human behind the camera in a way that would never happen with other road trip photographers. The images are curious but impersonal, like something shot by a robot studying humanity. One element of the West that comes under recurring scrutiny is the signage and advertisement, oversized tokens of humanity scaled up to the vast space of their environment. Wenders, in conversation with Bergala, says the signs and lettering are a substitute for human form. The size and garishness of American advertisement, each one a little ironic monument to American consumerism in a landscape defined by scarcity, are as foreign as the desert landscape to the travelling German. These images approach the effect semi-naturally occuring Barbara Kruger pieces: language superimposed on landscape attempts to redefine what the eye sees by asserting human ownership of the environment. 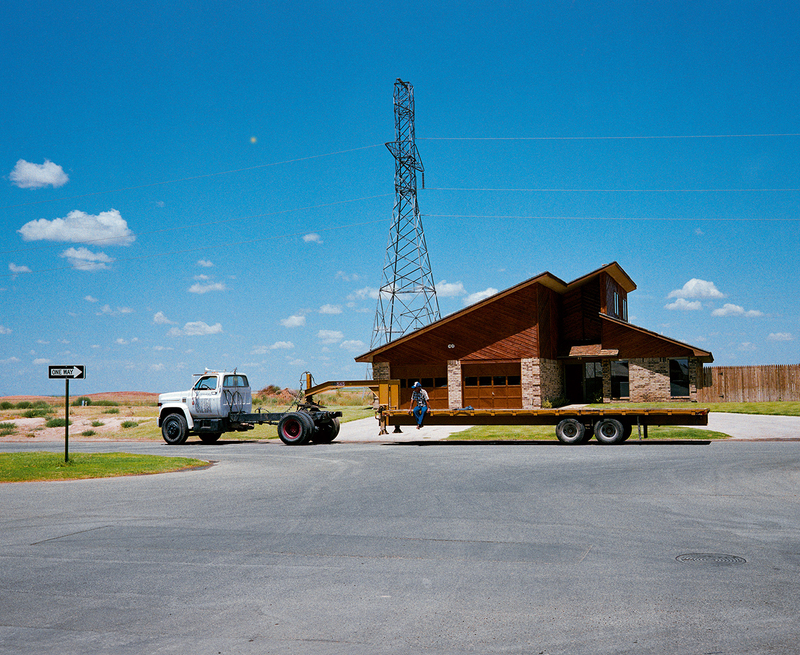 Other images, like Girls Park in Van Nuys California, recall John Divola’s photographs of one-room desert dwellings. In Divola’s images the human structures are subsumed into the natural environment as square buildings in square photographs. 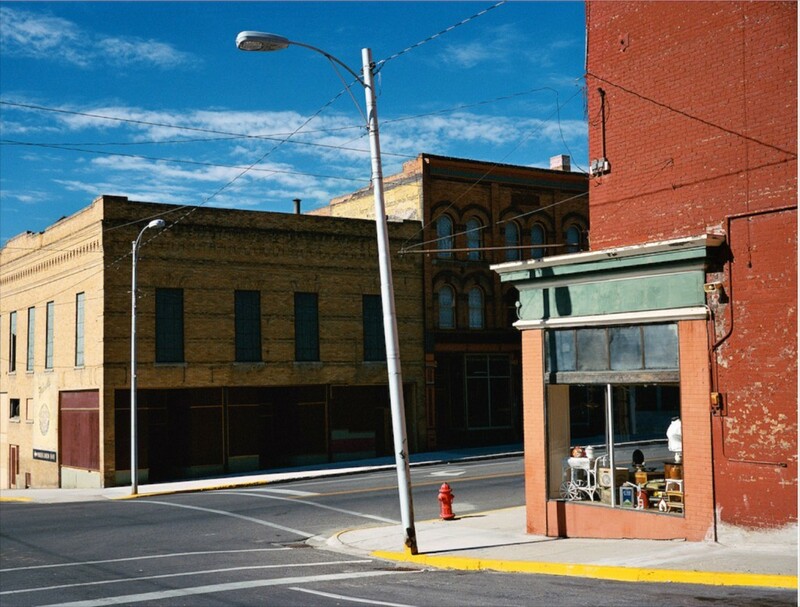 Wenders’ images of structures, while they have a certain flatness, stand out from the environment. Girls Park is an image of a windowless, neighborless box offering an array of life’s sordid pleasures – beer and wine, pool and games and girls, girls, girls. There is a strange visual humor in the incongruity between context and utility – the would-be pleasure dome on a barren road under an empty sky. On his return, however, Wenders runs the language-joke to the ground. 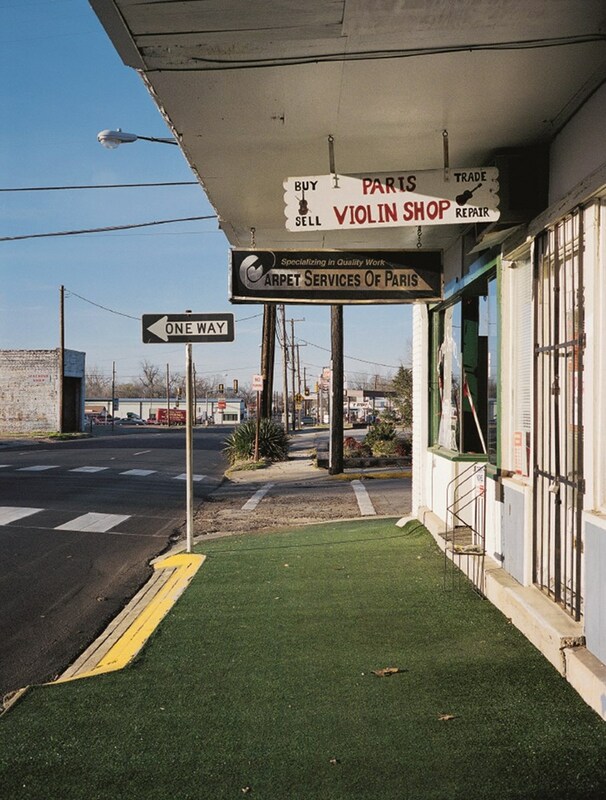 The new photographs, all of which were shot in Paris, Texas and focus almost exclusively on buildings with the word “Paris” written on them, put too much weight on a one-note joke Wenders made thirty years ago. On his return, however, Wenders runs the language-joke to the ground. 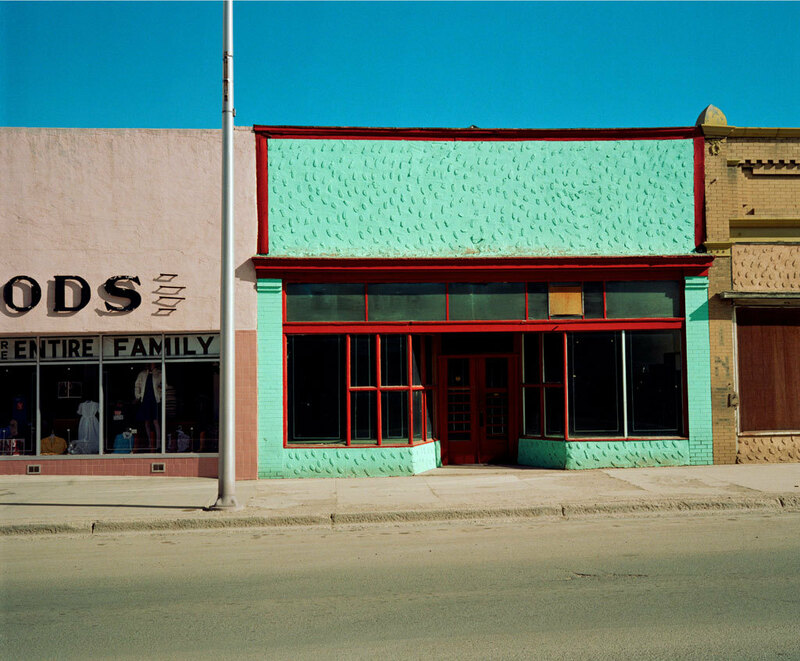 The new photographs, all of which were shot in Paris, Texas and focus almost exclusively on buildings with the word “Paris” written on them, put too much weight on a one-note joke Wenders made thirty years ago. 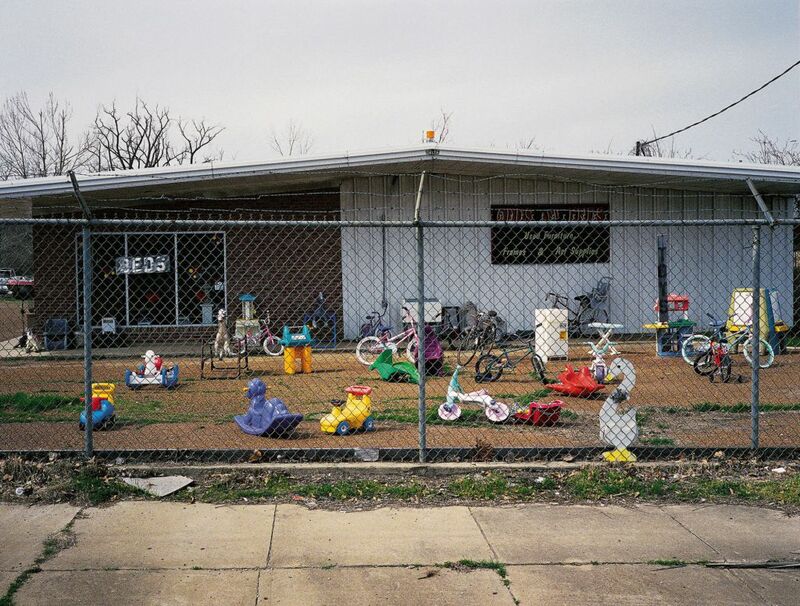 Still, when he eschews the visual pun he finds amazing, surprising stillness in a collection of plastic children’s toys strewn across a gravel lot behind a barbed-wire fence. This great stillness is the essence of Wender’s earlier images. Good artists are understandably wary of retracing their footsteps, and there is respect due for not making more of the same, well-received images; but the distance in this image gives the image room to breathe and captures the space necessary for solitude. 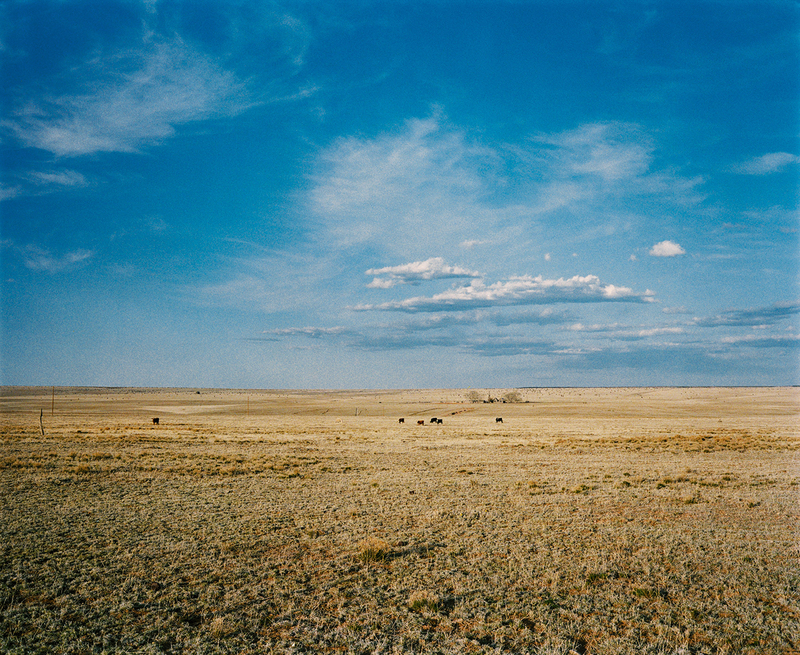 This space and solitude is, I think, what Wenders originally set out to empathize with, and which he evokes through light and landscape without recourse to a single tumbleweed. 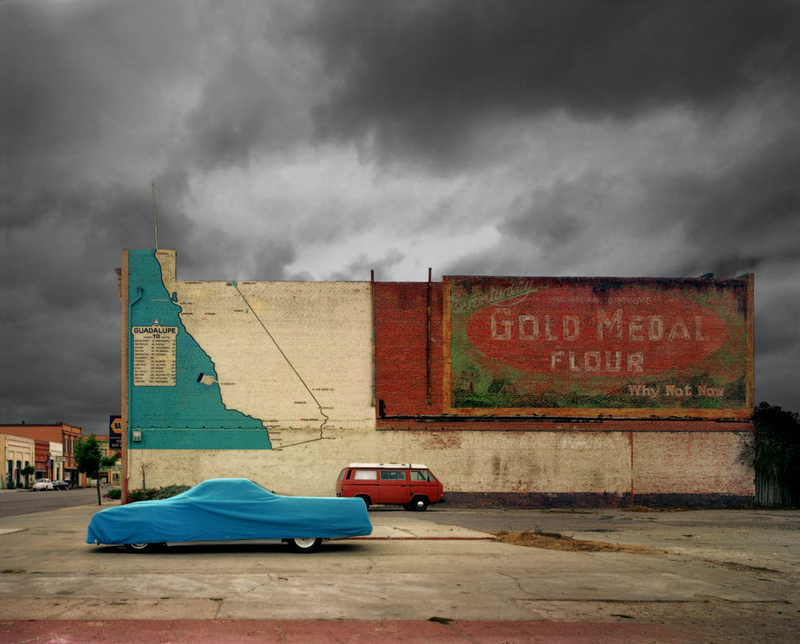 Posted in Feature, Highlights, Reviews and tagged 1980-1990, Architecture, Archive Highlights, Book Review, Cinema, Landscape, Owen Campbell, Paris Texas, Texas, The American Southwest, Top Picks, Wim Wenders.